As I write this in the first days of July, I am overwhelmed by the generosity shown by the extended Wesleyan family during the course of our THIS IS WHY fundraising campaign. When we started discussing a fundraising campaign in 2008, the financial world was teetering on collapse, and the economy in the next few years was enormously challenging. Yet we will finish the campaign having raised more than $480 million, blowing way past our goal of $400 million! As we’ve said many times, our three streams of fundraising were for Access, Inquiry, and Impact. Financial aid (access) was our number one priority—and we have created 152 endowed scholarships through this campaign. The scholarships and unrestricted endowment pledges total nearly $275 million. This is absolutely crucial for the long-term health of the institution because it makes us less dependent on tuition. Support for financial aid has allowed us to partner with programs like the Posse Foundation program for military veterans, and to eliminate loans for our low-income students while reducing reliance on loans for all. We meet the full demonstrated need of all our students, doing our best to ensure that everyone can thrive on our campus. Under the rubric of Inquiry, we have raised more than $145 million. At Wesleyan, inquiry is often tied to interdisciplinary work, and in this campaign we have underscored this element in the curriculum. In 2009, I was so pleased to commemorate the 50th anniversary of the College of Social Studies and the College of Letters with the creation of the College of the Environment, which now has a significant endowment. We have launched three additional interdisciplinary colleges in film, Asian studies, and integrative sciences, and we have raised money to support all of them. We have created endowments for our new powerful engine of engagement, the Allbritton Center for the Study of Public Life, and for the venerable (and extraordinarily nimble) Center for the Humanities. The support for Inquiry through the THIS IS WHY campaign will strengthen the teacher-scholar model at the heart of a Wesleyan education for many years to come. 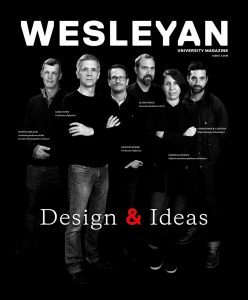 Everything we do at Wesleyan aims at enhancing the impact of our mission on the campus and ultimately on the world beyond it. The true test of a Wesleyan education is how it empowers students with creative and critical thinking to lead lives characterized by independence of mind and generosity of spirit (here I paraphrase our mission statement). Under the rubric of Impact, we have been able to create (and raise significant support for) the Patricelli Center for Social Entrepreneurship and the Center for Prison Education. Both of these centers have already had a powerfully positive influence on students, faculty, and community members. We have also focused on raising money for internships—from stipends for students who work with scientists here over the summer to support for students who take unpaid internships at not-for-profits. Since we went public with the campaign in 2013, I have spent a considerable part of my time meeting with fellow Wesleyans to ask them why they care so much about alma mater. I’ve wanted them to tell me what our university means to them, and then I have been able to describe to them how their gifts to Wesleyan enable us to strengthen the things they care about so much. This being Wesleyan, our supporters are not primarily interested in replicating the past. Instead, our supporters tend to want to recreate the conditions of change that have allowed our university to have a powerfully transformative impact on its students. THIS IS WHY. In the last six months of the campaign, our motto was “Let’s finish strong together,” and did we ever: with more than 3,400 gifts in June alone, pledges of $30 million in the last five days of the campaign, and the biggest single year of giving to Wesleyan in our history!